Immunogen: Synthetic peptide corresponding to aa 509-524 of bovine PARP automodification domain. Application Notes: Detects a band of ~116kDa by Western blot. Blocking Peptide: For Blocking peptide see Prod. No. BML-SP253. 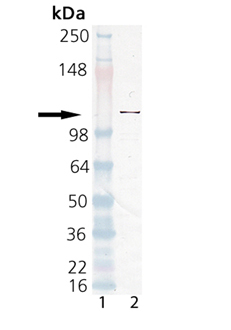 Western Blot Analysis of the Poly(ADP-ribose) polymerase, pAb (BML-SA253). Lane 1: Molecular Weight Marker, Lane 2: Human HL60 Cell Extract (BML-SW101).